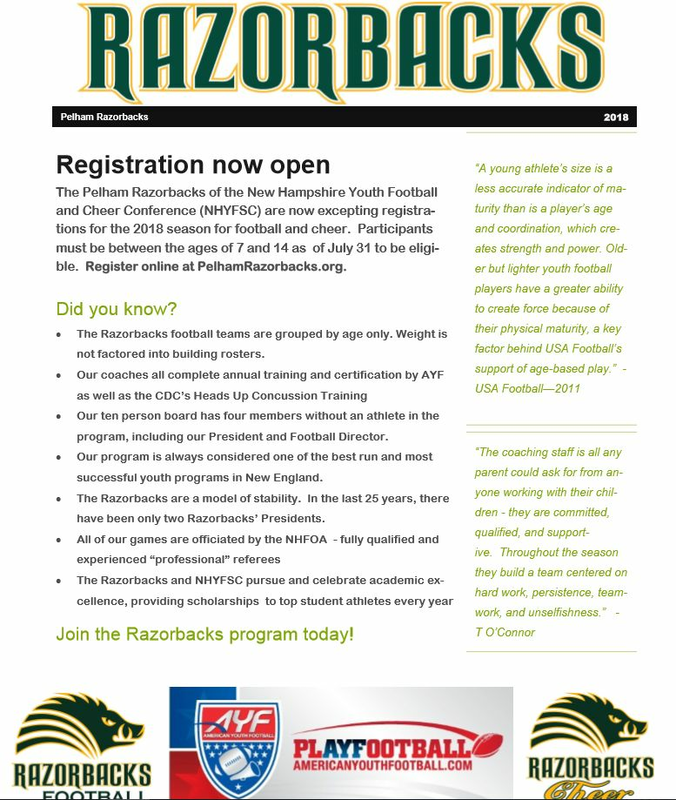 The Pelham Razorbacks are a proud member of the American Youth Football and Cheer (AYF) organization, the largest youth football and cheer organization in the country. The Razorbacks organization encourages the highest levels of sportsmanship, teamwork and fair-play. Our affiliation with AYF ensures our kids play football and cheer in a safe, competitive and fundamentally sound environment. New this season, the Pelham Razorbacks are using a paperless system for registration. This means that all of your douments need to be uploaded by you and there will be not be paperwork turn in nights like we have had in the past. Current 2019 Medical Release – copies of physicals are not accepted. If you have any questions regarding this process, please reach out to Tricia Pellerin at and we will also be available for questions on Wednesday, April 10th from 7pm-730pm at the Pelham Police Station Community room (prior to our monthly meeting which starts at 730pm). · Online Registrations will open on April 1st. Reminders will be sent the week prior. o We are always seeking new kids to join the program and are putting together a referral bonus program so have your kids encourage their friends to check us out when we have an information night(s) soon. o This year, we are going paperless so each registrant will need to upload all documents, including a birth certificate (even if returning player/cheerleader) when they register. If you need a copy of your child’s birth certificate, we will make available at our March meeting – swing by. · We welcome two new members to the board with Denise Capua as our new Fundraising Director and Jay Travis as our new Football Director. We wish Ken Eaves the best as our outgoing Football Director but he is not going far and will still be helping the program. · The Pelham/Londonderry Fall Fest Cheer Competition was a huge success thanks to the volunteer efforts of many. Although this is a cheer competition, both football and cheer families volunteered to raise a lot of money into our program. · The cheer program is getting new uniforms and warm up jackets this year – no doubt they will look sharp! · For those interesting in being considered for a head coaching role in football or cheer, please reach out to Jay Travis or Melissa Rickards (contact info on our website) for more information. Our goal is to have a football team at each age level and Division 8/10/12/14 cheer teams. Registration numbers always drive what we form. This is it for now, as always, please continue to visit our Facebook page for updates and information and another email will come at end of March highlighting the registration process. At last nights' November member meeting, the following individuals were nominated and accepted for the 2019 Razorbacks Board. Congratultaions all, and thank you for you future efforts. Thank you to retiring Football Director Kenny Eaves for his years of tireless service to the organization. This week starts the first of our 3 banquets where we celebrate another great year of youth football and cheer within the Razorbacks organization. We still have 2 teams going as 13U football are State Champions (again…) and D14 Cheer is also off to Regionals. Both these teams will be in action the weekend of November 17/18 in Nashua (football) and Manchester (cheer). Last weekend, our D8 Cheer team took home the State title but that level does not advance to Regionals. We need to ensure the venue is ready so we do not open doors until 530pm so we have check-in ready and the staff is set for us. Please plan accordingly. We set up enough seats for all who have tickets and tables are 10 seats per. If planning to sit with other families, it is best to be in a group of 10 and go in together. Dinner is family style with chicken on Night 1, Turkey on Night 2 and Chicken on Night 3. Feedback was overwhelming that although the ham was good, many did not want again. And yes, my fellow board member’s protest on no ham has been heard and noted. Fixins with the main course as well as ice cream & dessert. After dinner we will go team by team to allow coaches to speak about their year and present trophies/medals. After each team goes, we allow a 5 minute break for those who wish to leave. There is no offense taken as the team next up actually appreciates so it is not loud. But if want to stay, we welcome it; we just ask to always respect speakers and limit conversation at tables. We will have fun cash raffles each night for a variety of prizes. We will also offer a separate raffle that will span all 3 banquets for one free registration including calendars – a $265 value. Lastly – the first banquet is always the most challenging as it has the youngest age group. Last year was one of the best years because parents did a great job ensuring their kids remembered this was not a practice night and were well behaved. Please help ensure this occurs again at all our banquets as this is a chance for our coaches and their families to also celebrate the season. The wait-staff have huge trays and we need to respect them, the venue and each other and ensure kids act appropriately. Outside and downstairs are off limits and younger kids need to be accompanied to the bathroom by an adult. Equipment and uniform turn-in will be occurring soon so be on the lookout for emails and posting on when. Our November monthly meeting which includes nominations for board positions will take place on Monday, November 12th at 730pm at the Police Station Community Room. If you are interested in running for a board position, please contact me directly for an overview and expectations. Meetings are always open and you are encouraged to attend to see the nomination process and see what we discuss on running the program. There is so much more that goes on that many do not realize. This past Sunday, we put on our annual Fall Classic cheer competition with the Londonderry Wildcats. This is a huge fundraiser for our program and special thanks to all the volunteers who helped make this a great day. Many board members and others were there for a 10-14 hour day on Sunday and it is greatly appreciated. I say it every year at this time that the season flies by as we have completed our regular season and even had a playoff football game this week. Our 9U team sent a message early going up 6-0 on Londonderry but came up short despite a tough effort in cold conditions. We still have 2 more football teams going for a state title starting this weekend in Salem. See below for this and other important information. Also a gate fee but come early and pay once! Football Equipment Turn in for those no longer playing is Tuesday October 30th from 6p-7p at Muldoon. Friday Night Lanterns is tonight, October 26th from 6-8:30pm. Come join us for a pumpkin display, candy dig, outdoor movie and lots of fun at Muldoon!! Wear your costume!! The cost is $5.00 per person, $4.00 with a canned good. (One adult free per paying child) Please invite all your family and friends. A huge thank you to all the families that have carved pumpkins and donated candy and other items, the event would not be successful without your help!! State Championships are this Sunday at SNHU in Manchester! The girls have worked so incredibly hard for this day & we hope as many of you as possible can join us in cheering them on. Our D8 team will perform in session 1 at 9:50am, D10 is session 2 at 11:25am, and D14 will be the last session, session 4 performing at 4:50pm. 1st, 2nd, & 3rd place will advance on to Regionals on November 17th! (Except for our D8 team, who does not compete past the state level. This venue is cash only & there WLL NOT be an ATM available. Remember to bring your presale tickets with you if you took advantage of that opportunity. Purchase of your tickets are all on line now via the link below so please ensure you order by Friday November 2nd at noon – each attendee requires a ticket and it is family style servings. The main course will be chicken for the first one, turkey for the second and chicken for the last night. Although many enjoyed the ham last year, the overwhelming feedback was that chicken or turkey just can’t be beat! I cannot stress enough to purchase your tickets by Friday to avoid a late fee and please respect we need to get our seating counts in so the Harris Inn can set up properly. If something unforeseen comes up, please contact me but once our counts are locked a few days prior to each banquet, we own those plates and no refunds can be issued. I think that’s it for now – stay tuned for updates for the Saturday football games. Thank you to the Board of Directors, coaches, team moms and countless volunteers who made this a very smooth and successful regular season. Sunday home games are a long day with many at field as early as 7am and not leaving until after 7pm. A huge shout out to the parking volunteers as you have to admit, nice little experience for you seeing how some people just don’t get it and can’t read signs…. I can remember the days when we were worried about the heat and as I started to type this on Tuesday, I saw animals walking 2 by 2 towards a boat – that can’t be good! We are heating up as we have had 3 weeks of games on the football side and cheerleaders are gearing up for tournament season as they prepare for States. Razorback families are doing great with parking – thank you all! Also please ensure your guests know our process of not stopping, finding a true space and following the vested helpers. There is always space by the Little League Baseball fields and playground. Handicap parking is behind the shack – please ask for it and you will be directed. No pets are allowed inside the main football field – you may have noticed, I love dogs and would want nothing more than to allow but it is a town rule and I support it. There is no smoking or vaping allowed inside the main field or around the shack – please respect this if you choose to partake. Sunday, September 23rd – home games at Muldoon with 12U in playing in Nashua – see schedule on our home or Facebook page. Friday, October 5th – Mother/Son Dance at Nashua Country Club – This is open to the Pelham community and tickets available at Parks and Rec with cash or check made payable to the Pelham Razorbacks. Lastly, in my opening paragraph, I mentioned things are heating up and that is both on and off the field. I want to remind all parents, family members, friends and guests about fan behavior and our expectations on how we “Do Things Here”. We are not perfect and our coaches and others volunteer give countless hours to try to create a great experience for kids. Football games are intense and our bar is raised very high when it comes to winning. But we are and never will be a win at all costs program as of course it feels great for the players and fans to win but our program is also about the life lessons that sports can teach kids along with the relationships they create. Coaches coach, players play, officials officiate and fans are there to watch and cheer/clap. Please trust me from very personal experience, your kid DOES NOT want to hear you giving them or their teammates feedback or instruction during the game, practice or cheer comp. My ask is to please stop and/or don’t do it and cheer them on with support. I know it can be hard, again trust me from very personal experience, as it does not help and is counter-productive to the team and coaching staffs. We have some of the best coaches in the state – hands down! There is enough chaos during a game without more being added as the kids are nervous enough and hearing family and others in the stands yelling at them combined with coaches yelling instructions is not easy for any kid. If you have questions or concerns, game day is never the time but before you want to discuss anything with a coach, ask yourself, is this what your child wants or is this what you want? One thing we often ask of participants at the end of a game or competition, win or lose, is always “did you give it all you had on every play or every move”? Then we focus on moving forward, improving on where we just came from. Thank you for your continued support, cooperation and to everyone who volunteers, especially our coaches, team moms, board members, home game day helpers and all others that help create a great experience for all. A special shout out to Kim Travis and others who coordinated the Kickoff pizza party last month. The entire Pelham Razorbacks organization was saddened to hear about the passing of one of our finest members, Suzi Jozokos. We would like share our deepest condolences with the Jozokos family. In honor of Suzi and to show our support for the Jozokos family, we will be cancelling all Razorback activities on Wednesday, September 5th. Suzi and Mark represent what the Razorbacks organization is all about, by selflessly donating their time and effort to the children of the organization for over a dozen years. Suzi served as a Razorback parent, a Team Mom for two different teams, and also as the Razorbacks' Treasurer and board member. Suzi will best be remembered within the Razorbacks as the ultimate Team Mom as many of her standards and practices are still being emulated by others in the organization. She was selfless and always held all the kids in the highest regard over herself. Suzi always had cupcakes or goodies for the players and cheerleaders after each and every game win or lose. Her emails to the families were extremely fun and detailed, and left no question unanswered. She took team pictures throughout the season, from the first day of practice to the very last game and made some of the best end of season videos highlighting each and every player and created yearbooks for each team. She organized team parties, parent parties and end of the year coaches dinners. Most of the time she prepared and hosted these events in their home. Thank you Suzi for all of your hard work and dedication throughout the years. We are a better and stronger organization because of your efforts, and you will be missed terribly. We love you! On Wednesday, August 22 nd , we will have a season kick-off pizza party starting at 745pm at the soccer field. Pizza, hot dogs and drinks will be served. Parents are welcome and please ensure all kids are picked up by 845pm. Special thanks to Kim Travis for recommending and organizing! Picture day is this Saturday, August 25 th at Muldoon – see Facebook and your teams for specific times. Apparel will be for sale during picture times including orders for sweatshirts and jackets. This is the only time for jackets and sweatshirts so if interested, you MUST do it on Saturday. Credit cards will be accepted so buy in bulk! Turn in your calendar raffle tickets as drawing will start soon. New Razorback eye black for sale for players – 1 pair for $3 and two pair for $5. Great for gameday. Get them while they last. See Kenny after practice this week on Monday, Wednesday or Thursday as well as Saturday from 9a-10am. Let me repeat – see Kenny, our Football Director to purchase. Teams open on the road this weekend with most in Nashua – the full schedule will be posted on our website and Facebook soon. Game socks will be provided to Coaches and/or Team Moms for distribution this week. These are to be worn for pictures and games only and are part of the complete game day uniform. Team moms have game day uniform washing and drying instructions. Use cold water and please DO NOT put game shirts or pants in dryer – allow to air dry. Choreography went great and girls are progressing awesome! Girls will be outside as much as possible over the next few weeks so always dress accordingly for weather and wear bug spray. Bows will be distributed on Tuesday along with signed permission forms for competition. First game this Sunday and all cheer teams will be in Nashua. Anytime there is potential for bad weather, we need families close by as we may end practices early. Thus, please plan accordingly and be ready to pick your child up or arrange for another parent to take so we can get all kids away from field timely. When we see lightning nearby, we will pull kids off field and wait 30 minutes of no strikes and then return if field is safe. If lightning is off in the distance, we may not pull kids off right away so please rest assured we are on top of it and will err on the side of caution. Last week, parking and drop off looked pretty good but there are still a few that do not understand or possibly think your quick stop by main gate or between shack and soccer field does not create any issues. When dropping kids off, pull directly into a spot - please do not stop on the roadways. DO NOT move cones or drive around caution tape. Please pick up kids on time or arrange rides home as after a long day, our coaches want to go home too. There is still no update on the game schedule however opening day will be Sunday, August 26th. Team moms will coordinate help as it takes many people to have a successful home day. With fewer kids in the program and 1 less football team, we need everyone's help on game day with small roles to be filled. When everyone does their small part, the day runs great. Picture Day is set for Saturday, August 25 - your Team Mom or coach will provide details. Labor Day - no activities will be planned on August 31st through September 3rd so enjoy the long weekend. Lastly - this organization has been so successful through the years thanks to the hard work and time given of countless volunteers of board members, coaches, team moms and others - many of who no longer have child in the program but still come to help. My thanks to all of you! We may not be perfect and I am living proof but it is not from lack of trying and I and the Board always strive to do what is best for our entire organization. Sometimes, families may not agree with our decisions. As President, my role is to work with the Board to run this organization as best we can and I am always open to constructive feedback and I thank those who provide it. My ask is to have a solution or specifics on how it can be done better. Someone once said "I may not know the key to success, but the key to failure is trying to please everybody". Along with "This is how we do things here", these are two mottos I use as a leader. Gonna be a hot one this week so please ensure kids have plenty of liquids as we will keep them hydrated! Completed Medical Release form, signed and dated by a doctor in 2018. We DO NOT accept copies of physicals, it must be the Medical Release form. Purchased calendars to sell. This is our only mandatory fundraiser and you pay the $50 up front and keep the proceeds should you sell the 5 calendars at $10 each. If you decide not to sell them, turn them in with your own name on them. Elementary School report cards must be printed by parents. We need 1 copy. Directions for printing are at the bottom of the email. Please note that the Parent Portal for printing report cards is only open for a limited time. Middle School report cards are being mailed. We need 2 copies from Middle School students. High School Students that are Jr. Demos must contact the Guidance Office at the HS and request that a report card be mailed. You cannot print them online. Be sure that the school, the schools address, your child's name, grade and FINAL SEMESTER GRADES are clearly printed. Report cards that use a Letter Grade Base system need to submit 2 copies, Number Based only require 1 copy. Labor Day weekend, we do not have any Razorbacks activities on the Friday through Monday so make travel plan and enjoy the short break. This is it for now, stay cool and enjoy the summer. I wanted to take a moment to welcome you all to the Razorback’s cheer family! Whether you are a seasoned veteran or it’s your very first year, I am thrilled to have you joining us this season. I would first like to take a moment to introduce myself as the new Razorback’s Cheer Coordinator. My name is Melissa Rickards and my girls have been cheering for a couple of years now. I am a familiar face to many, as I have lived in Pelham my entire life and I also teach preschool at Kings Kids. I have had the pleasure of watching many of your children grow up! I am really looking forward to this new and exciting experience. I have many goals set for the year, but my main objective is for the girls to have fun, love what they do, and be the best athlete they can be. Cheerleading is a tough and demanding sport. We work hard at every practice and it’s so important to come prepared to give 110% each night. We are there to support our football teams, compete at our competitions, and also to give back to our community that supports us year after year. I look forward to a great season and cannot wait to see all that is in store for us. * Our season kick off cheer clinic will be on Wednesday, June 20th from 5:30-7:30pm at Muldoon Park. This is an optional clinic for any athlete to attend. We will be warming up and working with Drive Fitness at the clinic to learn the best ways to strengthen our cores and also allow for optimal flexibility for our sport. We will also be learning cheer motions, jumps, check out our tumbling skills, and lots more! It’s a fun night of exercise, games, and meeting coaches and teammates. I hope to see you all there. * Our season begins on July 30th! More information regarding teams, coaches, practice dates and times will be sent out in July. * Opening weekend is August 25th. Game times will be posted at a later date, but please keep in mind this will also be picture day. That should sum it up for now. I will provide you with more detailed information as the season approaches, but in the meantime, don’t hesitate to reach out. Enjoy the last few week of school and I look forward to meeting you all on June 13th! Wednesday is a busy day! Owen and Ollie's fundraising: Stop by for lunch or dinner and a portion of all proceeds will be donated back to the razorbacks. Paperwork: 7pm to 7:45pm is a paperwork turni in night at the Pelham Police conference room - just inside the Pelham Police entrance. Drop off any completed forms you may have (bully, medical waiver, concussion, etc) and avoid the crowds at future nights. Razorbacks Monthly Member Meeting at 8pm at the Pelham Police Department. April 30th is the registration deadline. Anyone after that date will pay an additional $25 per player. Registration closes on June 1st. The dates for football and cheer fittings will be announced shortly - stay tuned to our facebook page for updates. 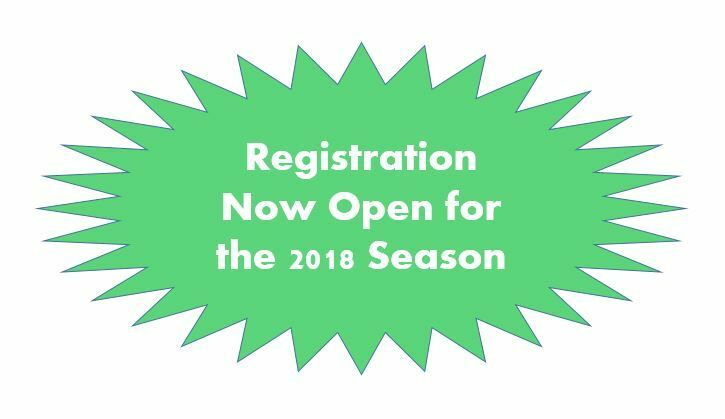 2018 Razorback Registration Is Happening NOW! March 31st - LAST DAY to register to get a free personalized t-shirt. Payments must be made in full by this date to qualify. You will be sent an email when registration is complete requesting a shirt size. April 30th - Late Fee of $25 is added to any registration made or paid after this date. June 1st - Registration Closes! Uniform fittings for Football and Cheer will be announced at a later date. Paperwork turns will be accepted at those times. The Razorback Information night is back on. Thursday from 6:30-8:00 at the Pelham Elementary cafeteria. Come on by for a chance to win a Patriots signed football, ora free registration (new families). Also see the newest Riddell gear, and learn how to get a free personalized t shirt. Unfortunately, the Razorbacks information night scheduled for Thursday March 8th has been cancelled because of the storm knocking out power to the town. We hope everyone has had a great winter and start to 2018 and believe it or not we are now less than 5 months away from our 2018 season. 2017 ended with our D10 Cheer team taking home 2nd Place nationally and our 12U football team inches away from a trip to Nationals. Thursday, March 8th – Razorback Information Night for returning and new families at Pelham Town Hall from 6-730pm. This is a great opportunity for any new families to learn more about our programs as well as for all families to meet out new board members. Football families can see a sample of our new football jerseys. Cheer families can see what our girls wear and new items being offered this year. For all those who register and pay in full prior to March 31st, the child will get a free Razorback personalized t-shirt. Monday, July 30th – Season start so we hope this helps you plan for summer. It is possible that we may only have a 3-week pre-season so it is important for your child to be there from Day 1. On our site you will find a copy of various forms that must be completed, signed and returned. Each year our Medical Release form requirement poses a challenge for some who do not have their child’s physical scheduled until after the start of the season. We do not accept copies of physicals to satisfy participation – this is the form that must be submitted. It is required to be signed off by a doctor with a date after January 1, 2018 for to satisfy this registration requirement. Get to your child’s doctor sooner than later as no child can take the field or mat unless this form is properly completed and signed. For those that attended our 2017 Mon and Son Fund Dance, we’d like your help in planning the 2018 event. Please fill out this survey for us so we can capture your feedback. Quick survey about the 2017 Mom and Son Fun Dance at Owen and Ollie's last season. As always, please continue to check our Facebook page for updates and information as we will continue to send emails like this but ultimately, the responsibility is on each family to stay up to date with information and if have questions, contact any Board member (listed on our home page – www.pelhamrazorbacks.com ). Head football coaching applications are now being accepted and must be turned in by March 5th, 2018. The form is availabel under Documents in the left menu. First member meeting of the year will be January 9 at 8 PM at the police station meeting room. All members are welcome to attend. The 2018 Board has been nominated and elected. Congratulations! The Razorbacks would like to extend our eternal gratitude for your endless hours of service and dedication to retiring board members Mark Jozokos, James Roche, and Stacey Schuler. We are under 6 months away until opening day of Razorbacks 2017. We have the season start date so please plan accordingly as first day of practices will be Monday July 31st. We go Mondays-Thursday until our first weekend of games and then teams set their own practice schedules which can include Fridays and Saturdays during the season. We do not practice over Labor Day weekend so that Friday through Monday is free for you. Payment is expected at time of registration. Registration not accompanied by payment is considered incomplete unless prior arrangements have been made through one of our board members. DO NOT register with a PO Box – we need a physical Pelham address. When listing an emergency contact, you must use a different name than the parent registering the child. Grade during the 2016-17 season is the grade your child is currently in. If they are currently in kindergarten – put “0”. Returning players/cheerleaders who properly register and pay prior to March 15th are guaranteed a spot on a team. New players/cheerleaders (along with returners) are then added after March 15th based on the date they are properly registered and paid. Although we do not anticipate teams maxing out, if we reach capacity, we place children based on their registration date and then create wait lists. Same as last year, we will only be accepting Medical Clearance forms. The form is provided under Documents on our home page along with the Concussion Awareness waiver and Anti Bullying Form. If your child’s physical is not scheduled until after the start of the season, you need to get this form signed off by their doctor prior to them taking field. The doctor must sign and date this form with a 2017 date. In June and July, we will have nights for additional paperwork turn in, including report cards. That’s it for now as continue to check our home and Facebook page for updates. Below is the link to register your child(ren). Happy New Year from the Razorbacks! It is not football and cheer season yet but as always, our board is in preparation mode. We will be opening registrations soon and similar to last year, it will be an online process. The registration dates will be announced within the next few weeks. Returning players and cheerleaders are guaranteed a roster spot if they register and pay within two weeks of the registration opening. After those first two weeks, spots on teams are reserved on a first registered – with payment, basis. Payment is expected at time of registration so please do not register without including payment as spots will not be saved. If there are concerns with payment as we know other sports are happening in the Spring, please reach out to me directly and we can review payment options. The 2016 season was another successful one with multiple state championships and our Division 14 Cheer Team taking 2nd place nationally. As you have hopefully heard me say many times, we are constantly striving to be the best, stay the best, and improve. Despite the successes we had last season with our scores on the fields and mats, our number one priority is that children have a great experience and take great lessons and memories from being a Razorback. This is just a sample list. What I am really after is some concise, tangible feedback on what you feel we do well and areas you feel we need to improve. Please keep it as objective as possible so that I can process it and either pass it on or look to create action off of it. Notice I use the word “I” earlier as the pink elephant in the room (on this email) is the disturbing trend in all youth sports nationally that families are afraid to give feedback on coaches or organizations for fear of retribution to their children. I am not saying it does not happen but in this case – “That is Not How We Do Things Here”. So now the choice is yours. If you would like to be heard or offer feedback, please email me directly (see below) and you will have to trust that I will treat the information carefully but will need to share in order to address topics or drive change. I will not share anything without your permission but if you do not allow me to share, then there may be things we cannot address. If you do not believe this, that is solely on you as I do not know of any other way to be a leader than creating an environment where people can trust you. If you prefer to talk, that is great too as I appreciate old fashioned dialogue. Just email me with a contact number and good times to chat and we will set something up. I look forward to hearing from many of you as well as to the start of our season. My contact info is below – please DO NOT reply to this email as it goes to our Razorback mailbox and not directly to me. The Razorbacks invaded Connecticut this weekend as we had 4 teams competing in the New England Finals. The weekend started with our D12 and D14 cheer teams giving their all against the best of the best in New England and both squads taking home 2nd place in their division. Our Division 14 Team will be continuing on to Nationals to compete in the AYF National Championships. On Sunday, our football teams took on the Connecticut state champs on their home turf and fought hard but could not capture the title. Congratulations to all our athletes and thank you to all the coaches and supporters on great seasons. Our banquets were a great time and great food as always. Next year we are looking to change the menu a bit and try the ham and turkey options to go along with a night of chicken. Congratulations to our new board members – Milissa Fox who will be our new Fundraising Director and Joy Cawley who will our new Cheer Director. Thank you to all our board members for their service this year and special thanks to Dawn Tucci for her many years of service as she has been instrumental in building our cheer program to one of the elite ones in the state and New England. We are now in close up mode as Kenny will be collecting all outstanding football equipment and uniforms as remember that all teams must return their game jerseys except 13U as they can keep theirs as they bid farewell to our program. Joy will also be collecting cheer uniforms. Lastly, with our Division 14 girls heading to Florida along with some 8th graders for all stars, you will see various fundraising efforts from them. Please help if you can or spread the word as there will be canning, raffles and other events to help defray costs. Keep an eye on our home and Facebook pages for updates from Florida as well as 2017 registration which will be here soon. Have a great Thanksgiving and holiday season. What a weekend! The boys kicked it off on Saturday with 10U, 11U and 13U traveling to Keene and making it a clean sweep as all 3 teams won a State Championship. 10U and 11U posted shutouts and 13U avenged their only loss of the year to defeat Goffstown in a nail-biting game. As impressed as I was with our teams and coaching staffs on the field, I was equally impressed with our fans in the stands as we all once again proved why we are the class of the state on how we do it here. Sunday was time for our girls to shine at the NHYFSC state competition with Tiny Mites posting top score followed by Division 8 taking home a State title. D10 was up against tough competition and Division 12 took 2nd followed by Division 14 earning yet another State title for our program. 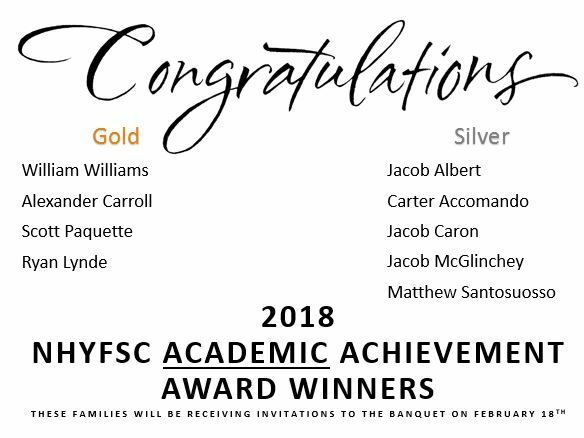 A great weekend and congrats to all! Next up is our Fall Fest Cheer competition on Sunday November 6th in Londonderry and we still need help with volunteers. We have 29 slots we need to fill and I am asking everyone to try to give us a 2-hour slot on Sunday for our biggest fundraiser. Please sign up at http://www.signupgenius.com/go/20f0d44afab2aa1ff2-fall or contact Timm Haskins or Katie Ketelaar if you can help. All volunteers will be eligible for a raffle to win a single 2017 Razorback registration so sign up now. Each slot you select and complete on Sunday gives you a raffle chance. In two weeks we have the New England Regional Competition for some of our teams so please keep checking our website, Facebook page and Twitter for details. Lastly, it is banquet season with our Tiny Mites, Division 8 and 8U teams on Tuesday night at the Harris Pelham Inn. You will not be allowed into the dining hall until 515pm so please plan accordingly. Seats are not reserved so please come on time to ensure your family can sit together. For those attending for the first time, this is a sit-down family style dinner followed by presentations. There is a cash bar. Dress code is at your discretion with many wearing what we wear to work for business casual or with our families for holiday mass. Children for the first few banquets must be seated with parents and accompanied to rest rooms with an adult. There is absolutely no running around as wait staff has lots of food and please remember that our coaches are there this night to relax and celebrate like everyone else. We have cash raffles for some fun prizes including a Razorback registration among other things. Dinner will start being served between 6-615pm. No tickets for any banquets will be sold at door and purchase nights have been completed. If something has come up requiring tickets, please contact your coach or team mom. See you all soon and thank you again for a great weekend! Congratulations to our Cheer teams! Regular season just ended for football, but for our cheerleaders, the competition has just begun. On Saturday, our girls picked up where they left off last year with great showings across the board. The season starts July 25th for both football and cheer and we are busy getting ready. 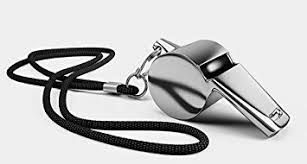 All football coaches have been notified of their team’s paperwork/payment status so if you are cleared for equipment, you can pick up on Thursday July 21st at Muldoon Park. Contact your child’s coach or team mom for more details and if you still have any questions or concerns, you can reach out to Football Director Ken Eaves at . For those still needing to turn in paperwork or make any payments, the last in-person time will be on Thursday July 21st from 6-730pm @ Muldoon Park. 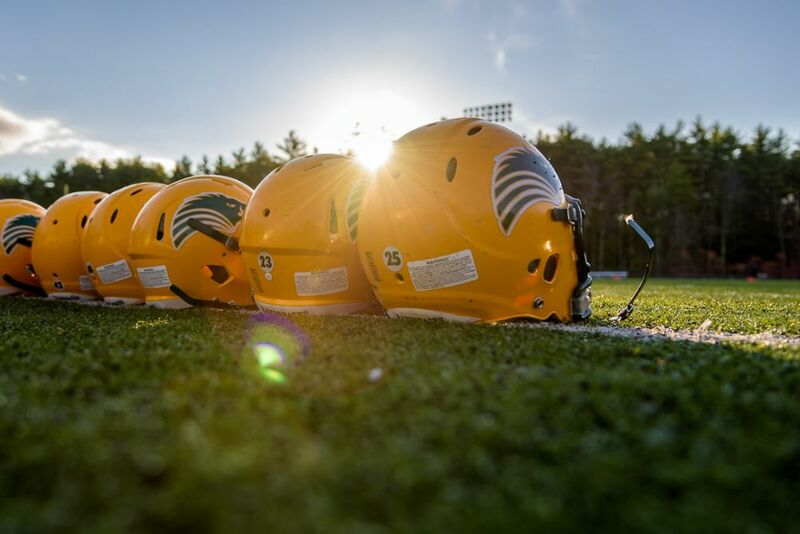 Football players must have everything complete byTuesday July 19th or they will not be eligible for equipment pick-up until the week of July 25th. There will not be any exceptions so please do not ask. Any child not having complete folders (all paperwork completed and turned in) and all payments by Friday July 22nd will not be able to take the field on Monday July 25th – again no exceptions. Reminder that starting on Monday, July 25th, we will go each Monday through Thursday from approximately 530pm-8pm each evening. The first week is all conditioning so it is shorts, t-shirts, sneakers/cleats, bug spray and plenty of water. There will be a final blast email next Sunday – enjoy the week!